When Bernie Madoff's investment company was revealed to be a huge Ponzi scam it was felt all around the world. Big investors lost huge chunks of money and were sometimes reduced to living middle class lives. Smaller families who made investments through his company found themselves broke without a penny to their name. While Madoff likely got what he deserved the less told story was that of his family, who largely played no role in the Ponzi scheme yet received much hate from people none-the-less. 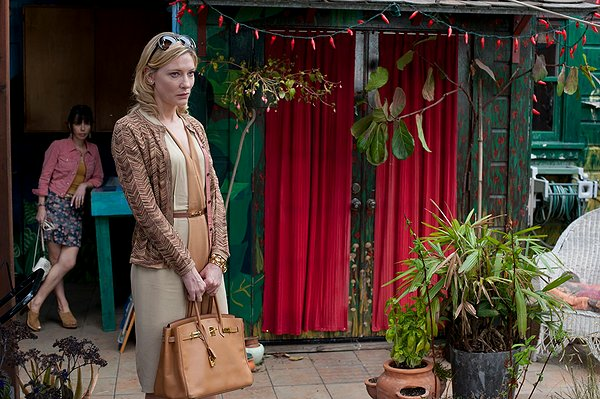 Woody Allen's “Blue Jasmine” is a fictional movie where it follows just such a person. This person is Jasmine (Cate Blanchett), who was once married to a man named Hal (Alec Baldwin) who ran a huge investment company. Very recently the company was discovered to be running an illegal Ponzi scheme and the two of them faced the consequences. While Jasmine herself didn't actively participate in the scheme her husband had her sign a lot of documents she didn't understand, and both wound up penniless by the time the government got through with them. Since she was an unwilling accomplice she was able to avoid jail time and was just sent to the streets (how thoughtful), where in desperation she ends up living with her half-sister Ginger (Sally Hawkins) and her two kids. Yet bad feelings from the past and a radical new lifestyle makes things difficult from the get go. For starters everyone who was affected by the Ponzi scheme walk up to her and tell her how much they hate her for what her husband did, as if it's her fault her husband turned out to be a criminal. Jasmine still goes to expensive stores to look around. She doesn't have money to buy anything of course, but she touches the windows with the longing look of a child who's just had their favorite toy taken away. The sad thing about Jasmine is that even though she is probably being unfairly blamed for events that were largely her husband's fault, she's largely unsympathetic to everyone's plights. When she talks to people she speaks to them as if they were her subordinates. She even has conversations to herself, where she justifies her life with people who aren't in the room. She ultimately doesn't want to see the damage her husband did to everyone else, just the damage he did to her. Blanchett plays her part magnificently well. A character like Jasmine is tricky to play because we have to be sympathetic towards her even though she's not a likable person. It takes an actress who knows how to walk that fine line to make the performance work, and Blanchett is more than up to the task. However it also takes a great director who knows how to write and direct a character like this so that she is believable in her emotions and thinking. This is what Allen does best. He is an actor's director and has enough faith in his cast members to let them do what they do while having a firm enough grip on the production that it all comes together perfectly. 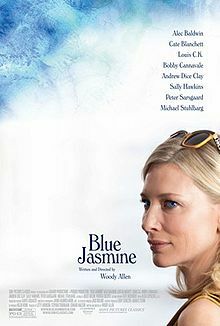 “Blue Jasmine” is also the first time in years that Allen has made a social commentary film since the scandal involving him and his stepdaughter got unleashed. Who knows why this is. Maybe he felt like he wasn't in the right place to make judgments about people when he himself did something wrong as well. However “Blue Jasmine” probably fits closer to home compared to many of the films he made in the nineties. He's been on the side of people judging him without knowing the whole situation (in his eyes). He probably felt like his life was falling apart like Jasmine does. “Blue Jasmine” isn't a justification for what he's done, just more of a sympathetic look at people we judge. At the end of the day people are at their best when they are compassionate towards one another, which is what makes “Blue Jasmine” so great and so depressing at the same time. Parents, there is some mild sexuality and language, but nothing too serious. Recommended for ages 13 and up.